Amanda Wendling - Making It Up As I Go: Mom, Are You Pretending to be the Mom? Mom, Are You Pretending to be the Mom? 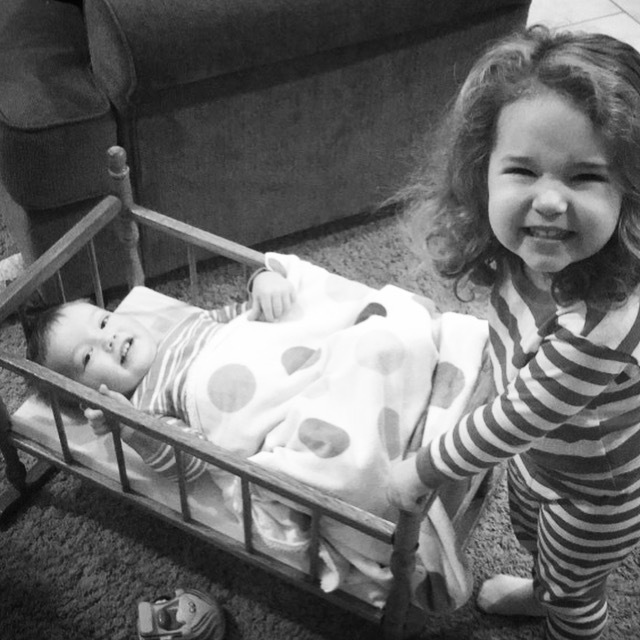 Both of my littles enjoy playing with babies. I love it. They sweetly kiss their dolls and swaddle them in blankets. They ignore all recommendations by their pediatrician and lie them face first on the floor to “go to sleep.” I’m serious, sometimes it looks like a baby doll graveyard in our living room while my littles alternate patting various baby dolls' backs. Recently, I was honored to play baby. I laid on the floor as Nora put a blanket over top me while she and Weston patted my back. As they finished getting me to sleep, I told them to lie down so they could play my babies. To which Nora responded; “Mom, are you pretending to be the mom?" Ah, yes, Nora! Every day for almost three years, I have been pretending to be the mom. When both of my kids are sick and throwing up simultaneously, I pretend. When sleep deprivation’s effects take over, I pretend. When someone is funny and / or cute when they are supposed to be in trouble, I pretend. When my toddler agrees to wear undies but not to pee on the potty, I pretend. When toddler tantrums seem to escalate by the day, I pretend. When one bout of illness fades into the next and scary thoughts run through my head, I pretend. And, when my heart expands by the day with not only love but the most immense pride in my two littles achieving new, hard things, I pretend I was prepared for it all!